Music has been used across the world to express political discourse, social segregation, basic human rights, and conventional rules. Music's role in conveying the will to freedom and justice is widespread in the world in general and in Africa in particular. For instance, South Africa's freedom song Nkosi Sikele'l Africa (God bless Africa) played an important role in the struggle against apartheid. Similarly, music has played a pivotal role in the Oromo political resistance against successive Habasha tyrant governments. Music in the Oromo political struggle can be seen as a liberating force, which uplifts, inspires, and shows the way for people to take part in the struggle against injustice and inequality. Oromo musicians and songwriters used their lyrical messages to serve social causes, to make political statements, and to voice the plight of oppressed peoples. Oromo artists have been basing their messages on their unique style of music, with fiery sounds and traditional Oromo sounds to call for an end to violence and inequality in their own country, Oromia, where the Oromo have been brutalized and denied their basic human rights. Through music, Oromo artists have revealed and developed their social, political and moral identities. In this paper, I situate Oromo music within broader themes in the world music. I also explain how Oromo artists, through their influential lyrics, have helped the Oromo deal with their sufferings, loss, frustration, and continued quest for social and political freedom. 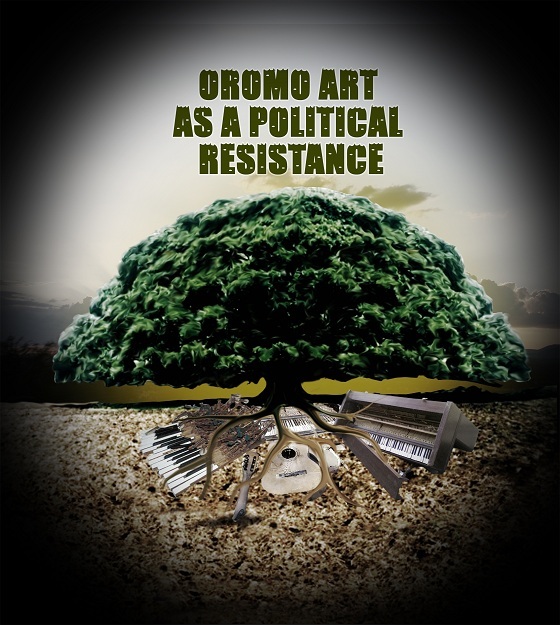 Oromo music has been used as a key element of political resistance by motivating the Oromo people to act against the injustice imposed on them. This paper focuses on three points. First, the paper explores the process and consequences of the expropriation of Oromo lands. Next, it covers the suffering of the Oromo people under the colonial regime, i.e. prosecutions, acts of genocides, imprisonments, and mass killings over the course of more than 100 years. Finally, the paper discusses the current Oromo situation and the acts of fierce high school and college students’ rebellions against the current ethnically ruled Ethiopian government. Music as an art in Eastern Africa is extremely important in understanding popular culture and its role in shaping the society. Music in the Oromo political struggle can be understood as a liberating force which uplifts, inspires, and generates pathways to freedom; it motivates the people to take part in the struggle against the inequality and injustice that have been imposed on them by the Habasha rulers. For years, Oromo musicians and song writers have been delivering lyrical messages which have served as key element in the struggle of the Oromo people by raising their voices and telling stories of their continued struggle. In addition to delivering political statements, Oromo musicians have been able to use their lyrics as a conduit for the development of the social, moral, and political identity of the Oromo people. Out of many influential Oromo artists that have contributed to the advancement of Oromo people’s struggle, I have chosen to examine the works of five artists. Their contributions have strengthened the political quest of the Oromo people. These artists have served as genuine nationalists: they have revealed the crimes of the Ethiopian government against the Oromos and how the people must stand up, unite with great force to end the injustices imposed on them to reclaim their fundamental rights to freedom. Through lyrics they have been able to confirm that freedom requires a lot of sacrifices, yet it can be achieved with determination. The five artists I have chosen to examine their valuable works here are, Ali Bira, Umar Suleyman, Usmayyo Mussa, Ilfenesh Qanno and Adnan Mohamed. These artists are only a few out of many talented Oromo musicians. I decided to include their performances in this paper because of the accessibility to their music and lyrics that are relevant to this paper. The works of Oromo artists reflect the balance between the past, present and future. Memoirs of the past, exigencies of the present and anxiety over the future compromise the currents that propel identity articulation. Identities are actually bounded by questions regarding the resources of history, language, and culture. These questions concern the process of becoming as opposed to an actual state of being. For years, Oromo artists have been aggressively intervening in art world and the real world in order to put music in touch with society, to interpret art, to protests injustice, and to encourage political engagement. As the region fell under the Ethiopian occupation in the late 1800’s, Oromos lost their lands to the Ethiopian ruling class and state that took control of Oromia’s rich grasslands. Oromos were forced to submit to colonial settlers (Neftagnas) and serve as semi-slaves. They were to comply with these obligations or they would be removed from their lands. Sometimes they were evicted without real reason. For over a century, Amhara-Tigrayan colonial settlers have occupied Oromia and exploited its economic and natural resources. The northern Ethiopians, due to years of exploitation, could not guard their resources and as a result suffered from soil erosion, which has left them with few fertile lands. Furthermore, the government of Ethiopia seized Oromo lands under Emporer Menelik II in the late 19th century and continued under Emperor Haile Sellasie during the earlier years of 20th century. They took Oromia lands and distributed it among government authorities, military officers and emperor’s families as a reward for conquering the Oromo people. In this way, the successive Ethiopian governments have increased and controlled the flow of agricultural products. The Ethiopian government put itself in charge of the cash-crops and natural resources, an act which enabled them to do business with international corporations, without profit-sharing with the lands original owners. The Oromia’s rich land is the home of coffee; an abundance of gold, and natural gases and similar resources. These have been the spotlight of Ethiopia’s economic success in the international markets. Over time, many men and women revolted by organizing themselves in villages determined to reclaim ownership over their land and resources. Within their given space to maneuver, movements of groups and individuals began to organize themselves secretly, to assess their situation as citizens denied of their rights to land ownership. As these political uprisings began to unfold, individuals sang songs of expression that coalesced into a message of awakening for Oromos, heightening their social consciousness level and instilling in them a desire to resist. To describe the situation, singer Umar Suleyman sang songs, which fueled mass protests against the Ethiopian regime. It also motivated people to bear arms to fight for freedom or join liberation army forces, creating controversy and stirring fear within the government. Opinion became a very important form of expression, among varies sectors of society that face censorships of freedom of speech and expression. Artist Umar Suleyman found inspiration in this idea in the early 1990’s by singing, “Dinnee didaa ufitti hinfuunuu hinfuudhin idaa (2X), madaabaraa shame gurgurachuuf fidee, ittiin facaafnan ree lafti baasuu didee,” which means, ‘we refuse to use any kind of fertilizers to grow our crops because it is expensive, expired and can't be used to grow anything, thus it ruins our soil and can put us into debt.’ This expressed the frustration of farmers who had been forced to grow their crops using goods that did not produce but destroyed their land, and mired them in poverty. Similarly, other nations have expressed social discontent in other ways, such as in “Rai” music. “Rai” means “opinion” in Arabic, and “Rai” music spoke out against the censorship of freedom of speech and expression by non-democratic Arab governments. Currently, “Rai represents an alternative mode of protest for liberation,” (Al-Ta’ee, 2). Similarly, music’s aesthetic and linguistic appeal has been a vital tool in the Oromo people’s political struggle to further their political quest. As Tibetans sang patriotic songs in the past to protest the jailings and mass killings perpetrated on their people, Oromos have been singing similar songs to shed light on the brutal acts being committed on their group. Many artists were sentenced to prison for life or killed for singing songs that objected to the Ethiopian government’s acts of cruelty. The other role music has played in Oromo political resistance is restoring the near complete loss of identity and culture that resulted from the Abyssinian invasion. One of the most significant aspects of their cultural identity which Oromos nearly lost because of Ethiopian subjugation was the Gadaa System (the democratic governing system of Oromos). Gadaa is a system of generation that organizes the Oromo society into age groups that have different responsibilities in the society, which changes every eight years. Gadaa has eleven age grades (Gadaa class) of developments, where each grade has different levels of power. This has guided their social, political, economic life of the Oromo people. Gadaa system has also played a role in the Oromo peoples philosophy, astronomy, art, history and method of time-keeping. “Gada is the heart of the political-military organization. So deep is the people’s valuation this institution that it stands at the core of the Oromo cultural identity. Gada serves as the Oromo national emblem even in areas where the institution has lost functions under the weight of colonial rule, cultural assimilation, religious pastoralization and communist revolution,” (Legesse, 103). The legendary musician and singer Ali Bira, who introduced the Oromo art and language on various international community in the 1970’s through his popular lyrics sang about the Gadaa, “karaan mannii Abbaa Gadaa eessaa?” which asks, “where is the pathway that leads to the Gadaa hall? He taught his people the responsibility they should carry to learn about the Gadaa system and write about it so that it could be handed over to the next generation. Ali also sang about the importance of cultural preservation of the Oromo language, “Afaan Oromoo hundee Oromummaa,” “Afaan Oromo the founding root of Oromo's identity.” Ali’s work paved the way for the contemplation and the study of Gadaa system in particular, as well as Oromo culture in general. Perhaps one of the fiercest and greatest uprisings out of the Oromo community that occurred and spread extraordinarily within short period of time was amongst the dedicated Oromo students. Early in 2000, a group of Oromo students in Finfinne (Addis Ababa) University began to organize demonstrations in protest of the current regime and its acts of genocide on the Oromos. Since then, there has been growing numbers of incidents in which many students stood up against the undeserving acts of dismissal of honor students from schools for discriminatory reasons and the disappearing of many students across Oromia. In some cases, students weren’t allowed to enter certain universities because they were expected to do better than non-Oromo students when they graduated from high school by taking the Ethiopian School Leaving Certificate Examination (ESLCE), a standardized test that measures students’ ability. Through their music and inspiring lyrics, Oromo artists have played an important role in explaining the oppression and exploitation of the Oromo people. They have also motivated and mobilized different sectors of Oromo society by raising their political and cultural consciousness and by encouraging them to join the national struggle for self-determination, emancipation, and liberation. In order to overcome the oppression and exploitation of Ethiopian colonialism, Oromo musicians have been leading the way as dynamic and creative political activists. Oromo music has proven useful as a means to further the oral recording of history, conquering ignorance, and educating and leading the way for the liberation of the Oromo people who have been torn apart by civil war and famine. Oromo activist musicians have played a positive role in restoring lost Oromo identity due to the years of oppression. We have to recognize that music in the Oromo political struggle can be seen as a liberating force which has been used to uplift, to inspire, and to light pathways for the people, driving them to take part in the struggle against the inequality and injustice that have been imposed on them by the Habasha rulers. *Special thanks to Salahadin (Daga) Abdulle, for his guidance and support in making this paper a success. Most importantly, I would like to thank Umar Suleyman, Ali Bira, Usmayyo Musa, Ilfenesh Qanno, Adnan Mohamed and all other Oromo artists and musicians who shared similar inspirational lyrical messages with the Oromo people. Their great contribution that has strengthen the struggle of the Oromo people by restoring great hope in them will continue to be remembered. Demitu Argo was born in Adama and came to the U.S at the age of 7. She obtained her BA in June 2008 from University of Washington and is currently working and residing in Seattle, WA. Her interests are reading and writing in qubee Afaan Oromoo.